July 5, 2012 - In the early 1990s, scientists at GE Global Research came up with a tough new material that could outperform super-alloys used to make jet engines, and was also one-third lighter. Since weight cuts fuel use, shedding pounds is always a big deal in aviation. But the team faced a skeptical crowd. The material was a form of ceramics, which can take a lot of heat but have been known to break on impact. GE spent the last two decades developing the next-generation material, called ceramic matrix composites (CMCs). It is strong, tough, and also amenable to mass production. CMCs are made from silicon carbide matrix toughened with coated fibers made from the same material. 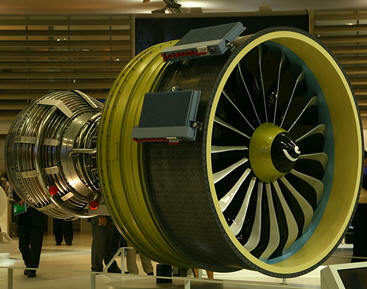 They are already working inside CFM’s new LEAP jet engines and advanced gas turbines. The material is light, one-third of the weight of nickel super-alloys, but extremely durable. It can work in temperatures as high as 2,400F, well beyond any advanced alloy. “Silicon carbide is fantastic,” Vartuli says. “It is the lightest and strongest material that can work at high temperatures. But if you make a coffee mug out of it, it will break when you drop it.” That’s where the fibers with GE engineered coatings come in. They make CMCs behave like a metal when they’re hit. “There’s no concern about catastrophic failure,” Vartuli says. As a result, airline customers can keep their lighter planes flying longer between engine check-ups, add new globe-spanning routes, and save millions in fuel costs. But CMC applications reach beyond aviation. GE is already testing CMC parts in gas turbines for power generation. Why? Just one percentage point in added efficiency saves millions in fuel costs annually, and reduces emissions thousands of metric tons of CO2.